If you apply each component of “A Lawyer’s Creed,” developed by the Chief Justice’s Commission on Professionalism (the Commission), to the ideals of integrity in golf—and vice versa—the similarities between the game and the practice of law are even more striking. To my clients, I offer faithfulness, competence, diligence, and good judgment. I will strive to represent you as I would want to be represented and to be worthy of your trust. Do you remember how hard law school was? Learning how to play golf can be equally difficult. Once you’ve learned the basics, improving your game and maintaining a standard high enough to enjoy playing can be even more challenging. Many times, you’ll feel like quitting. As in practicing law, golf takes a lifetime of hard work, concentration, training and patience to stay at the top of your game. 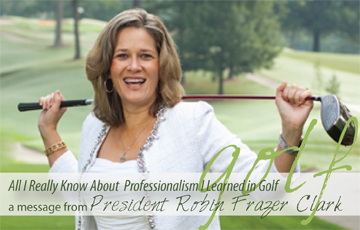 In golf and in our law practices, we are always seeking to improve. Everyone knows Tiger Woods, but do you know who Sean Foley is? Only avid golf fans are aware that Sean Foley happens to be the guy who (at present) teaches Tiger how to play golf. Yes, Tiger Woods, the world’s current No. 1 player, takes golf lessons. So does Rory McIlroy and Phil Mickelson. So did Jack Nicklaus and most every great golfer you’ve ever heard of. Admittedly, the sessions Tiger has with his teacher might not look like the lessons a beginning golfer would take from the local club pro. In the ever-elusive pursuit of the perfect golf swing, Tiger and other professional golfers are in a constant state of fine-tuning the near-perfect. In the golf grill at Torrey Pines, engraved in the slate above the fireplace, Geoffrey Chaucer is paraphrased: “The lyfe so short, the game so longe to lerne.” The point is that, no matter one’s experience and expertise, we never stop learning, whether in golf or in legal professionalism, we never stop learning. That is why we are required to take professionalism CLE credits on an annual basis. The Commission approves and oversees more than 500 professionalism CLE sessions per year and produces the curricula and materials for those sessions. The Commission expanded its focus to include judicial professionalism by assisting the Institute of Continuing Judicial Education in developing programs on professionalism for Georgia judges. To the opposing parties and their counsel, I offer fairness, integrity and civility. I will seek reconciliation and, if we fail, I will strive to make our dispute a dignified one. Temper tantrums and other demonstrations of “unsportsmanlike conduct” have no place in the legal profession, or on the golf course. The top golfer of the first half of the 20th century was none other than Atlanta’s Bobby Jones. He won 13 major championships and, if not for his own integrity, would have won another. In the first round of the 1925 U.S. Open, Jones was about to hit a shot out of the rough on the 11th hole at Worcester Country Club near Boston. As he took his stance, the head of his club brushed against the grass and caused a slight movement of the ball. No one saw this except Jones. After taking the shot, Jones informed his playing partner, Walter Hagen, and the USGA official accompanying their match that he was calling a penalty shot on himself. Hagen and the official tried to talk him out of it, but he insisted he had violated the rules and took the penalty stroke. In what other sport would a situation like this take place? To my colleagues in the practice of law, I offer concern for your welfare. I will strive to make our association a professional friendship. In golf, proper etiquette is just as important as competency, and often more so. For example, you remain still and silent when your fellow competitors are taking their shot. And when on the green, you don’t walk in their putting line between the ball and the hole. You congratulate others’ good shots and refrain from laughing at their bad ones. As in the practice of law, time is a valuable commodity in golf. Show up promptly for your tee time. Maintain an appropriate pace of play, and let faster players play through. In short, show consideration to others at all times—whether on the course, in your office or in the courtroom. When in doubt, refer to the Golden Rule. To the profession, I offer assistance. I will strive to keep our business a profession and our profession a calling in the spirit of public service. In golf, this is called taking care of the course. In the fairway, replace your divots. On the green, repair your ball mark and one more that someone else failed to fix. After hitting from the sand, rake the bunker completely. You do these things not to help yourself but to leave the course in the same or better condition for the golfers behind you. To the public and our systems of justice, I offer service. I will strive to improve the law and our legal system, to make the law and our legal system available to all, and to seek the common good through the representation of my clients. The raging issue in golf these days is over the R&A and USGA’s decision to ban the use of the long putters that some players anchor against their bodies to steady their putting stroke, much to the chagrin of many successful players on the professional tour who use those long putters. But regardless of how that matter is resolved, protecting and improving the game is the ultimate responsibility of those who play the game. The same is true for the legal system. We are, after all, in this together. There is, of course, one huge difference between golf and legal professionalism. Golf is just a game. For most of us, a good day or a bad day on the course won’t be life-altering. That is not the case in our law practices. We are responsible for protecting the rights of our clients. Many times, the outcome of our work can have life-changing consequences. No one is perfect, and winners and losers in the legal system are often determined by circumstances we cannot control. But lawyers must always bring our “A” games, and when it comes to professionalism, we would do well to incorporate golf’s lessons of honesty, integrity and courtesy into our service to the public and the justice system. A closing thought: Many of us whose favorite avocation is playing golf have no doubt fantasized about trading in our day jobs for a career of fame and fortune on the professional tour. But consider that the aforementioned Bobby Jones, the most accomplished golfer of his era who later co-founded the Augusta National Golf Club and the Masters Tournament, never turned professional. In fact, Jones retired from competitive golf all together at the age of 28 in favor of his chosen profession: Georgia lawyer. Robin Frazer Clark is the president of the State Bar of Georgia and can be reached at robinclark@gatriallawyers.net.